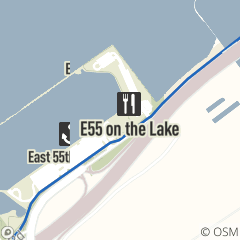 Accompany a day on Lake Erie with a fresh meal on the patio of e55 on the lake. Check out our menu. Sit on the patio and enjoy appetizers, sandwiches, wraps and salads. All of our meals are made from the freshest ingredients and many of the items on the menu are homemade. Open daily 11 a.m. – 8 p.m. The Rental costs includes time for any set up and break down, as well as all tables and chairs, glasses, plates, and flat wear. A basic linen package is also included with all rentals, black or white table linen and linen napkins. Any additional or upgrade of linen is available for separate cost.